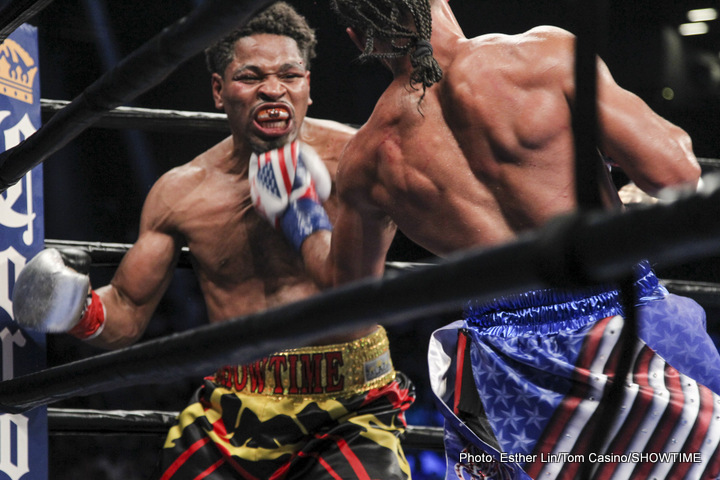 Last seen going to war with Keith Thurman in last summer’s FOTY candidate, former IBF welterweight champ Shawn Porter is ready to make his return to the ring soon. According to Porter’s father and trainer Shawn Porter Senior, who spoke with The Las Vegas Review Journal, fellow former welterweight champ Andre Berto is the preferred comeback opponent. A Porter-Berto fight could well prove exciting, as do most fights involving Porter. Berto has been largely inactive over the last nine months or so, last fighting, and winning, against Victor Ortiz in their rematch last April; Berto improving to 31-4(24) with the easy stoppage win. Berto is still young enough at age 33 to perhaps make another run at the title. Porter, 26-2-1(16) and the younger, fresher man at age 29, would be seen as the favourite to win, but Berto, when he’s in shape and injury-free, can give any welterweight in the world a tough night. And we have yet to see how much, if anything, the Thurman battle took out of Porter. Berto doesn’t get stopped often (just once, by Jesus Soto Karass in a savage battle, one that saw Berto suffer a shoulder injury) while Porter, as he showed against Thurman, has a phenomenal chin. This one, if it happens, could be a great action fight; one that goes the full 12 rounds. But will it be Berto’s last hurrah or a good, quality comeback win for Porter? A Porter stoppage would be impressive, but a points win looks more likely.